Summary: Learn how to fit skirting board, remove old skirting board, cut skirting board, fix skirting board, fix skirting board to a masonry wall and fix skirting board to a timber stud wall. Firstly, run a sharp knife along the top of the skirting board to cut through any wallpaper or paint sealing the join. Chip away any plaster or wood filler with a lump hammer and bolster chisel. Starting at the doorframe, position the blade of the bolster chisel into the join between the wall and the top of the skirting and tap the chisel with a hammer. Lever the skirting board away from the wall. Remember that where boards meet in a corner, one board will be nailed over the other. Once a gap has opened up between the skirting and the wall, slot a strip of wood into the gap to protect the plastered wall. Insert a crow bar between the skirting board and the strip of wood and prise the skirting away from the wall. If you find a particularly stubborn section of skirting board it may have been fixed with nails or screws, which will be difficult to detect on the front of the skirting board as the heads will be covered with filler. 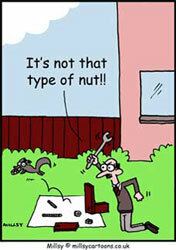 Try to unscrew any screw fixing. This may not be possible in which case, as with any nail fixing, it will need to be cut using a cold chisel or a hacksaw blade. Proceed along the length of skirting, pushing in wedges of wood behind the loosened skirting as you go, until it comes away from the wall. Before fixing your new skirting board prepare those boards which will meet at the corners of the room. For internal and external corners, the ends should have a mitred join of 45º to create a clean joint. You can use a mitre block to make this cut, but a power saw with an adjustable blade will give you a more accurate cut. Remember that although the angle of cut is 45º for both an external and internal corner, the direction of the cut differs. If you are fixing skirting board to the wall of a long room or hallway you may need to make a joint before reaching a corner. This should be done using a scarf joint cut at a 45º angle. The two ends creating the scarf joint should be glued together and secured using angle pins. If fitting ornate skirting board the method of creating an internal corner joint is different. 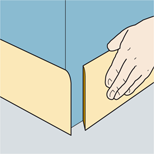 The end of one length of skirting should be placed tightly into the corner. 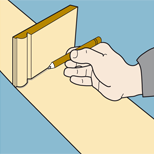 Using an off-cut of skirting board mark with a pencil the outline of the shape of the skirting board onto the end of the piece of skirting that will make the joint. Carefully cut along the guideline using a coping saw. Then fit the skirting tightly against the first piece to create a clean joint. An uneven floor may leave ugly gaps below the skirting board. To remedy this you can mark and cut the bottom of the skirting board so it will follow the profile of the floor. But remember that if you do this, the other lengths of skirting in the room will also need to be cut - even if they are flush to the floor on which they rest - to keep all the skirting the same height. Put the skirting board against the wall, checking that it is level at the top and fits flush against the floor. You can push small wedges under the skirting board until it is level. Rest a pencil on a small piece of wood slightly bigger than the largest gap to create a small scribing block. Run the wood along the surface of the floor with the pencil point addressed to the skirting. This will create a guideline that follows the profile of the floor. 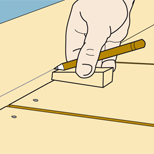 Carefully following the pencil line use a jigsaw to cut away the bottom of the skirting board. The skirting board will now be level and fit flush against the floor. 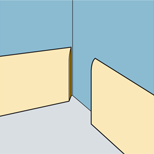 An internal corner should have a mitred join of 45º. An external corner should also have a mitred join of 45º but the direction will differ. Using an off-cut of skirting board mark the outline of the shape of the skirting board onto the end of the piece of skirting that will make the joint. Run the scribing block and pencil along the surface of the floor, this will match the floor profile. Ensure your new skirting board is the same height as the one you are replacing, otherwise you will have a gap between the top of the skirting and the bottom of the plaster, which will need to be patched. If your skirting board is not as thick as the old one, place another strip of wood behind to push it out further from the wall. The type of wall to which you are fixing the skirting will determine the fixing method. Different methods may be required for different walls in one room. Prior to fixing, apply a wood preserving product to the back of your new skirting board to prevent rot. Ensure the wood preservative is completely dry before applying adhesive in line with the manufacturer's guidelines. Having applied a solvent-based grab adhesive to the back of the skirting board, push it against the wall. Use a spirit level to ensure the top of the skirting is level. Using a power drill fitted with a masonry bit, drill two pilot holes - one above the other - every 300mm (1ft) along the length of the skirting through the timber and into to the wall. To ensure the screw heads will sit below the surface of the timber, fit a countersink bit into the power drill and enlarge the openings of all the pilot holes. Push wall plugs into all the holes and screw the skirting to the wall. Fill the holes with wood filler and use a mild abrasive sandpaper to smooth the surface. Any small gaps at the joints or between the skirting and the wall can then be filled with filler. Fitting skirting board to a timber stud wall requires you to locate the vertical studs. If replacing old skirting board the nail holes may be visible on the plasterboard. However, if this is the first time skirting is being fitted to the wall you'll need an electronic stud finder. As a rule vertical studs are 400mm (1ft 4in) or 600mm (2ft) apart. Position the skirting board against the wall and having located the vertical studs, mark their position on the front of the skirting board. Apply a solvent-based grab adhesive to the back of the skirting board and position it against the wall ensuring the top is level. The skirting board can then be fixed to each vertical stud using either screws or lost head nails. Having fixed the skirting board to the wall, ensure all screw or nail heads are below the surface and covered with filler. Similarly, any small gaps between the joints, wall and the skirting board should have filler applied.